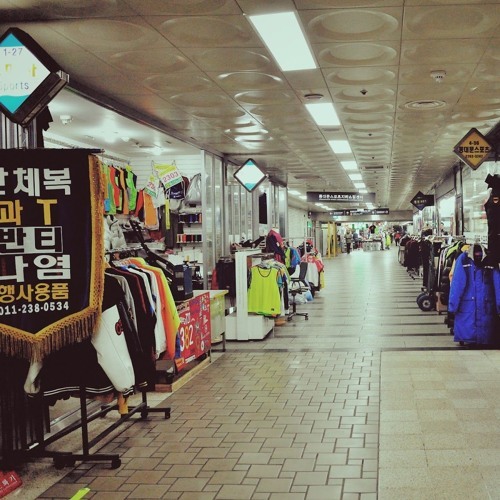 We head down into the Euljiro Underground Shopping Center, a nearly two-mile-long subterranean street running beneath downtown from the City Hall to the Dongdaemun History and Culture Park Line 2 subway stations. Initially opening for business in 1983 at the same time Line 2 itself did, its ever-changing selection of shops supply everything from tailored clothing to computer equipment to medical supplies to punch clocks to electronic cigarettes to freshly baked bread and freshly roasted coffee — not to mention a safe haven from the weather during cold winters like this one. The Euljiro Underground Shopping Center can feel like a part of the city time forgot, but now that it has begun providing space for art installations and hosting exhibits like those of the recent Seoul Architecture Festival, what does its future hold?